Hotel Villa Panama – a modern stylish hotel by the sea in Odessa, in the centre of resort area “Arcadia”, a few steps from the beach “Arcadia”, close to the most fashionable nightclubs of the city. Our hotel offers 24 spacious and comfortable rooms (Standard - 12, Junior - 8 Suite - 4) with large balconies where silence, serenity and comfort to create a unique atmosphere of appeasement, and the sea breeze will blow away from everyday worries. At the hotel you can enjoy the fine cuisine of our restaurant, swim in the pool in the fresh sea air and get a sunny tan, or just relax in the shade on our summer terrace with a cup of fragrant coffee. We will endeavor to make your stay in our hotel brought an unforgettable experience and you want to come back to us again and again. 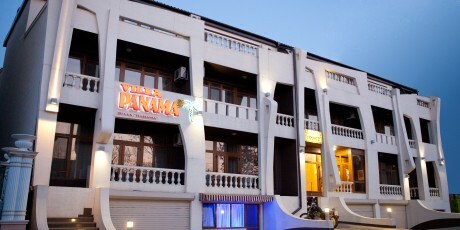 Welcome to the Hotel Villa Panama!